We have all been there: sitting at home, nice and cozy on the couch or bed, feeling safe and warm while the wind howls outside. Then it happens, the power goes out. Cold immediately starts to seep in through the windows and everything seems scarier in the dark. This scenario could be avoided if you had a stand-by generator. Well, if you live in Passaic County, NJ, then you are in luck. 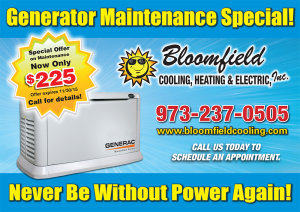 At Bloomfield Cooling Heating & Electric Inc., we have the perfect stand-by generator for your home to ensure that you never have to worry about going through that situation again. Our certified technicians have been helping people in Passaic County for over 25 years to select and install the perfect generator for their needs. 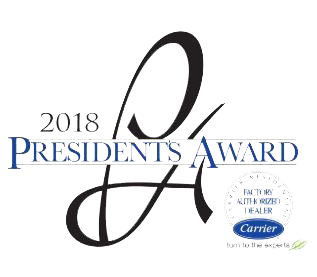 We install the industry’s best brands (Generac and Honeywell) and our technicians are fully licensed through Generac Power Systems, Inc.. Depending on your home and your needs, our certified technicians will help you select the model that will supply the power that you need (from 7kW to 22kW). We will make sure that you understand how to operate and maintain your new stand-by generator before we leave your home. Not only will everything be installed to your satisfaction, our technicians will not leave until they are sure that the stand-by generator is working properly. They even will simulate a power outage and will watch how the generator operates to ensure that it is at optimal capacity and performance. Our technicians are able take care of all repairs and maintenance on your stand-by generator for years to come in your Passaic County home. 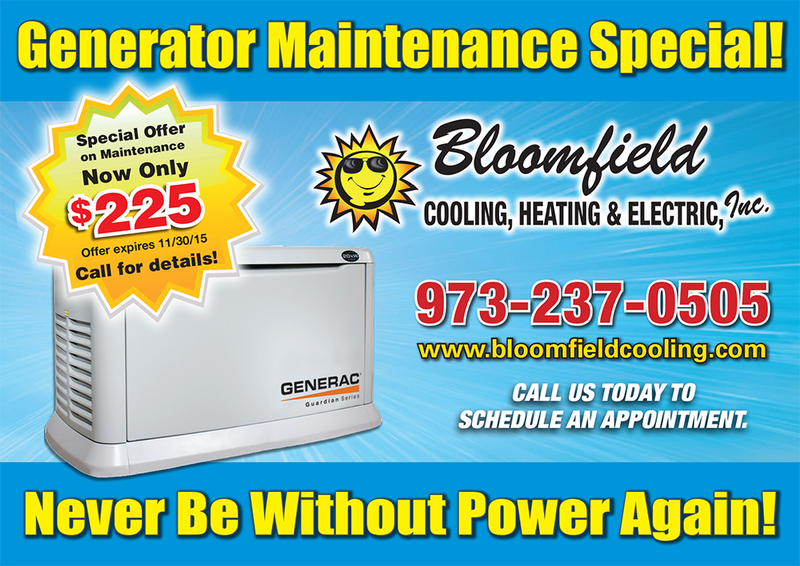 Do not wait until a power outage happens, contact Bloomfield Coolong and Heating, Inc. today and get your free evaluation and estimate for your new standby generator so you are prepared for the worst that Mother Nature can show you.